Classic Suezmax bulk-carrier "Keoyang Orient" passing Cuxhaven on her way to Hamburg port with iron ore from Saldanha Bay, South Africa. Spotted from ferry "Saaremaa" on 29.01.2016. Sorry, there is no such thing as a 'suezmax' bulk carrier. Typical 9 hold/hatch bulkers 100,000+ DWT are capesize. Only tankers 120 - 200,000 DWT are described as 'suezmax'. 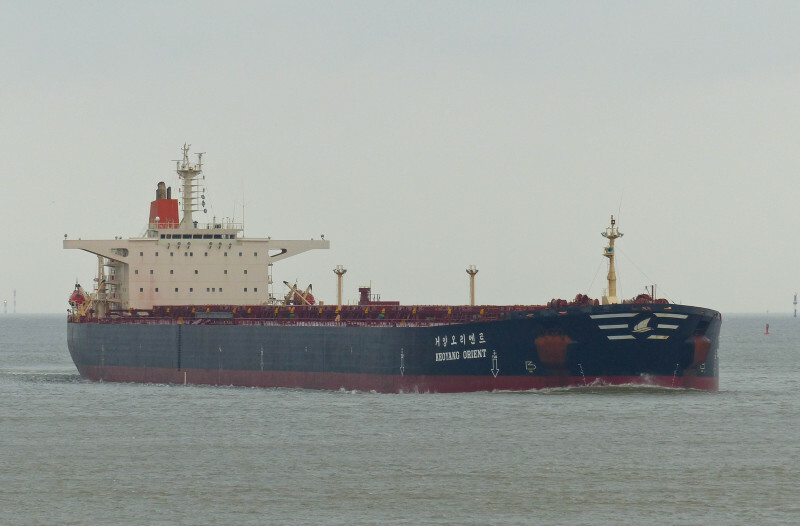 Yes Marcus, these "classic" suezmax/capesize bulk-carriers have become scarce on the river Elbe. Therefore I was really happy to catch this one more or less by accident. Thank you for your kind comment my friend, I enjoy your recent photos from Hamburg. Great shot of the Keoyang Orient passing Cux, David! I missed her departure from Hamburg, yesterday. A nice bulker and not the youngest.